A wedding band is a symbol of your commitment to your spouse and the vows you make when you get married. Choosing a ring that fits your lifestyle and personal sense of style is a major decision. This is a ring you will wear every day for years, so it must be durable as well as attractive (duh). 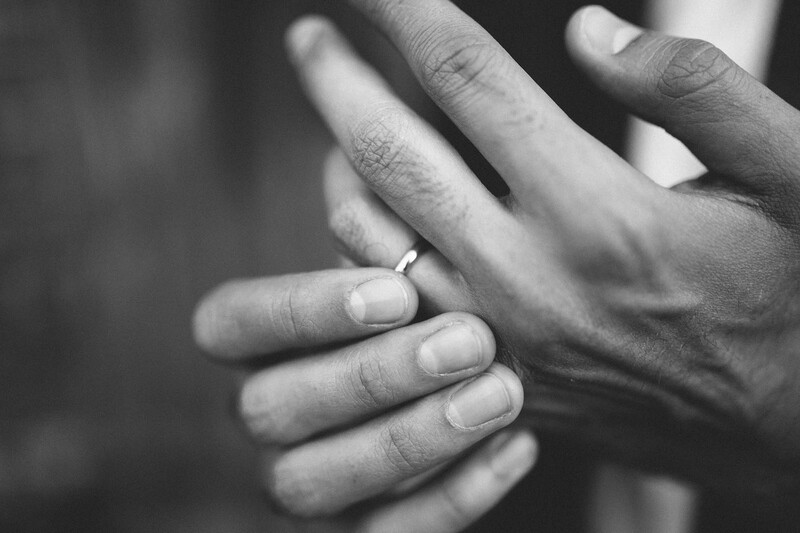 If you’re out looking for your wedding band and are unsure of what you choose, don’t fret: in this article, I’m going to lay down five tips that will make your life on the bandwagon (ha) a little easier. The material you choose for your wedding band is going to play a long-lasting role in your band’s attractiveness, durability, and wear. Choosing the metal used is nearly as important as choosing the style: it must match with your lifestyle and personal priorities. 10k – Strong, but also the least “pure”. 10k is a great choice for tradespeople, those that are “hands-on”, and guys that want a ring that they don’t need to worry about losing shape, getting dented, or scratching easily. 14k – Not as strong as 10k, but most people wouldn’t know it. 14k gold is a great blend of function and form. 18k – Not nearly as strong as 10k, and softer than 14k. In my humble opinion, 18k is the ideal purity for most men. 24k – The “I want goooooold” purity. A 24k band will be much softer than those that come below it, but it’s purer. I wouldn’t recommend a 24k gold wedding band as it is likely to get dinged up through normal wear and tear. Learn more about gold purity here. Not Feeling Gold? No Problem! The days of yellow gold being the default color for a guy’s wedding band are quickly coming to an end. Titanium rings for men – in addition to cobalt, tungsten, platinum, and a host of others – give guys options well beyond gold. Which is best? That’s for you to tell me! The type of metal you chose will have a significant impact on the color of your wedding band. Certain materials – such as platinum or tungsten – are quite limited in their coloring options. However, that doesn’t mean you need to be limited: pick the color that works for you, and revise the metal to match if needed. This is decidedly personal and not for me to dictate for you. If you want a black wedding band, go for it! They look awesome! Feeling something more natural? Check out a wooden or ebony-colored band: both are widely available, and again, they look awesome! Maybe you want something really different (like purple). Well, guess what, you can do that too! A band can be more than just a plain band if you want it to be. As men, we are fortunate in that we can go really simple – literally just a band – or as complicated as we want. It matters much less because men don’t need to worry about adding to the band later (unlike a woman’s wedding ring, which typically is expanded with 5 and 10-year bands). You don’t have to go bananas here: just pick a band you like and want to wear every day. If it is just a simple band, that’s no problem! So long as you enjoy it. Consider going decidedly unconventional – Meteorite, dinosaur bone, wood, and cork are just a few of the unconventional materials available for use in your wedding band. Think these materials may be a little passe or too trendy to last? Think again: dinosaur bone has been around for tens of millions of years (that seems pretty timeless to me). Drop the expense and go nu-age – Silicone wedding bands are becoming quite popular and for good reason! For many men, the wedding band is simply a formality that they begrudgingly accept at the behest of their brides. For others, the wedding band is an important – but ultimately minor – detail in their wedding arrangements. In either case, investing in an expensive wedding band probably feels inappropriate. Enter silicone, which is both attractive and inexpensive. Fantastic! Need More Tips? Interested in More Ideas?